Korean superstar Psy released the world smash hit Gangnam Style in July 2012. The song traveled the world’s radio stations and received over a billion views on YouTube. What made this hit unique in the United States is that most of the lyrics are in Korean. In the past, foreign dance hits tended to be in Spanish, such as the “Macarena,” which was a sensation almost twenty years earlier in 1995. While the world was dancing Gangnam Style, physicists were making a huge scientific leap; they found evidence of the Higgs Boson or “God Particle.” In 2012, The CERN’s Large Hadron Collider in Switzerland was able to identify the Higgs Boson, an essential particle in the Standard Model of Physics. 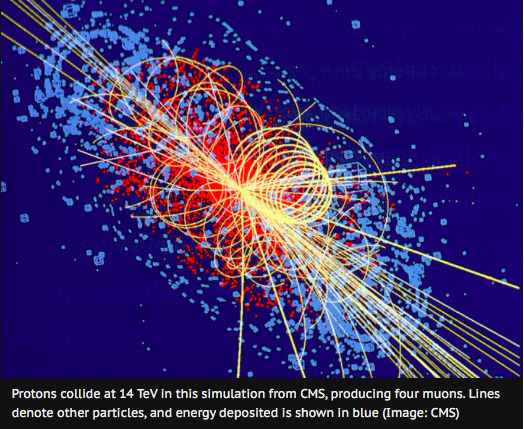 The verification of the Higgs Boson brings the theoretical work of Peter Higgs and five other physicists from the realm of hypothesis to fact, which won them the Noble Prize in Physics. As scientific discoveries are made, we wonder how students’ interest in studying science may be impacted. In 2012, the TFS included questions about students’ prior education in math and science. In the physical sciences, which includes physics in most school systems, 31.5% of students had taken one year of physical science while 31.8% had taken two years and 29.6% of had taken three or more years of physical science classes. The majority of students (80.1%) had taken four years of math while a select 7.5% had taken 5 or more years of math between grades 9-12. We also found that 30% completed an AP Calculus course and 15.4% completed an AP Probability and Statistics course. What is welcome news is that an overwhelming majority of students (81.1%) had taken a pre-calculus or trigonometry course before entering college. TFS also collects data on students’ intended major, career interests, and goals. From all the possible major choices (See the end of the survey for a complete list – Item number # 23), 2.5% selected majors from the aggregated category of physical science that includes physics, chemistry, other physical science, astronomy and astrophysics, and earth and planetary science. It is not surprising that 22.4% of physical science majors selected scientific researcher as a probable career choice, while 18.1% selected being a physician as a career choice (For all career choices given see Item number #34). One of the goals students are asked about is the importance of “making a theoretical contribution to science;” 59.6% of physical science majors reported that it was “essential” or “very important.” Students entering physical science majors have a desire to make scientific breakthroughs, however, a little more than 1/5th identified scientific researcher as a career choice. As great leaps were occurring in science, 2012 also marked a significant year for U.S. politics; President Obama was re-elected for a second term. The political theme that arose during the campaign was income inequality. The 2012 TFS has one item that asks students to directly consider the issue of income inequality. We found that 64.6% of incoming students “agree strongly” or “agree somewhat” that wealthy people should pay a larger share of taxes than they did at the time. When cross-tabulating views about income inequality with political views (e.g. How would you characterize your political views? Scale: Far Right, Conservative, Middle-of-the-road, Liberal and Far Left), we find that 66.4% of middle-of-the-road students “agree somewhat” or “strongly agree” that wealthy people should pay a larger share of taxes than they do now. What is of interest is that a little over a third (34.9%) of far right students “agree strongly” or “agree somewhat” that wealthy people should pay a larger share of taxes than they do now, while 85% of students on the far left “agree strongly” or “agree somewhat” with the wealthy paying more in taxes. In sum, regardless of political views one could argue that there is a shared understanding of income inequality. 19.3% of incoming students considered themselves Pre-Med. 6.3% of incoming students considered themselves Pre-Law. 2.6% of incoming students were ROTC, cadet or midshipman at a service academy.